In the recent World Investment Report delivered by the United Nations Conference on Trade and Development (UNCTAD), despite a 21 percent drop of investments across Africa, Kenya showed the largest increase in Foreign Direct Investment (FDI) indicating a 76 percent growth. It is with such successful numbers that Business Ireland Kenya has continued to encourage more Irish companies to not only visit the country but to open businesses in different sectors. 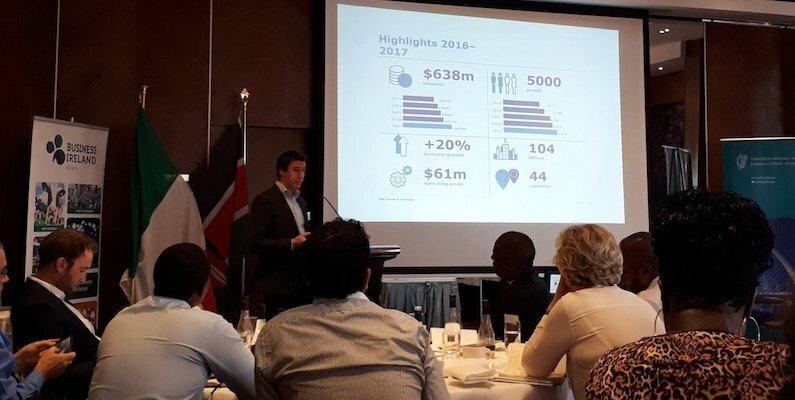 Through the launch of the updated Business Ireland Kenya Doing Business in KenyaGuide in 2018, BIK is keen to ensure that Irish companies are well informed on the commercial opportunities and the business operating environment in Kenya, and that they are equipped with the necessary information to succeed. According to Dr. Vincent O’Neill, the outgoing Ambassador of Ireland in Kenya, BIK has seen tangible positive outcomes from the growing trading relationship between Ireland and Kenya that have resulted in the signing of business agreements and an increase in the volume of trade between both countries. Irish companies who are members of BIK have also enjoyed support from the Embassy through linkages, information sharing and networking opportunities. The Africa Development Bank (AfDB) projects that Kenya’s 2018 GDP of 5.6 % is expected to rebound to a 6.2 % growth in 2019. This is an indication that there are opportunities for Irish companies across various sectors. In his State of the Nation Address to parliament in May 2018, the President of Kenya, H.E. Uhuru Kenyatta outlined affordable housing, food security, manufacturing and universal healthcare – dubbed ‘the Big Four’- as his primary policy priorities for the next five years. He declared all Government efforts and investments would be rallied around the delivery of these priorities and encouraged private sector investments in these four areas. This presents numerous opportunities for Irish companies with expertise in these sectors and BIK will continue to engage and support its members to identify and realise these opportunities in the context of the delivery of the Big Four agenda.